Rigs, ships moving away from Gulf Oil Spill Site as tropical Storm Bonnie Approaches…well cap stays on? Following Federal orders on Thursday night, crews began disconnecting the rigs drilling the relief wells in anticipation of Tropical Storm Bonnie’s arrival. This will delay the effort to plug the Macondo well by up to two weeks. BP and government officials also said Thursday that the cap now sealing the well and preventing oil from flowing into the sea will remain in place during a storm evacuation. For the past week we have been treated to twenty-four hour monitoring of the well cap, done to detect pressure, any seepage of oil, methane bubbles and other indicators that a leak is present. Depending on their mood that day, BP and the Feds of course either deny the leaks or play them down as inconsequential…but just to play it safe, we have been assured time and time again, the well cap is being monitored round the clock. Officials had been weighing whether the well could remain shut if the site was evacuated for a storm, because there would be little in the way of surveillance at the site to notify officials if something went awry. But Allen said scientists studying pressure readings and seismic and sonar indicators at the site now feel comfortable leaving it shut in. “We have determined that if we have to leave the site we are prepared to leave the well capped,” Allen said. The decision came on the recommendation of Department of Energy Secretary Steven Chu, Allen said. First Question…is the Department of Energy more reliable than the EPA? Second Question…Okay, so it’s safe…good; what could possibly go wrong? 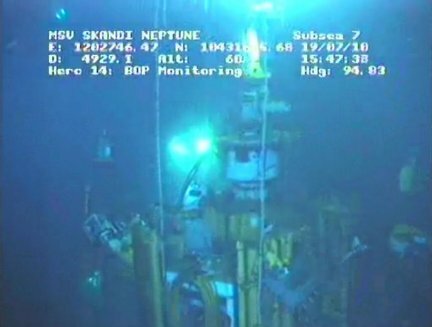 The point is, as soon as the ROV submersible’s leave the Macondo well site, the information on the cap will stop and this is quite contrary to twenty-four hour monitoring. The ROV’s have also been doing sonar scans of the sea floor so if there is a rupture of any kind we will not know until this storm is over. It will be at least 48 hours before monitoring can begin again and a lot could happen within this time frame, or nothing might happen, point is we won’t know. The debate at one time centered around the possible removal of this cap during a storm to play it safe, as Thad Allen says, “to err on the side of caution,” but safety appears to no longer be the main concern. If the cap is removed, and we are all again treated to the sight of oil gushing into the Gulf, British Petroleum will lose all PR gains made this past week. And that, is the main concern.